"I sculpt beautiful, voluptuous, fierce women. My raw material is emotion, my medium is bronze." This is the first sentence of my biography as internationally collected bronze sculptor. 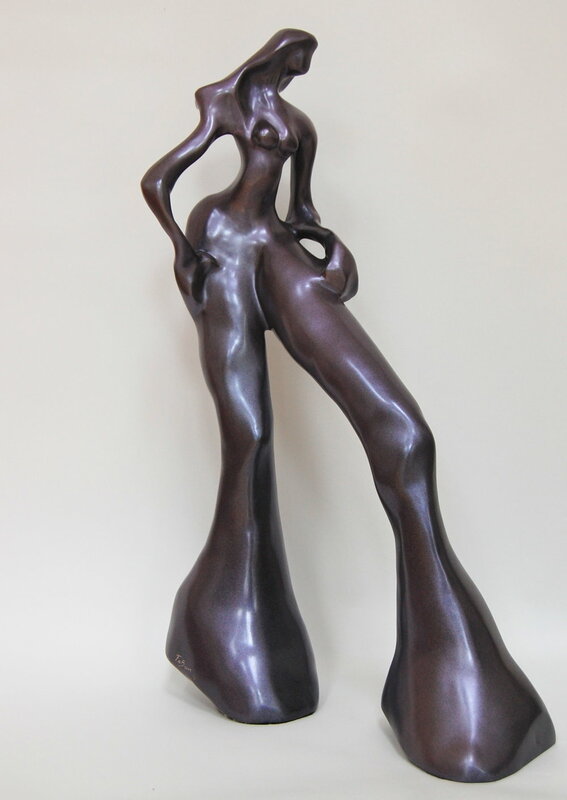 Since 1999, I've put "femininity into three dimensions, capturing the power, glamor, beauty and vulnerability of the female form in bold yet sensuous bronze. My work represents some of the powerful and fierce women. Those who could be seen in fashion magazines or in daily life: entrepreneurs, businesswomen, mothers and spouses who need to fit in so many different roles that they forget their own self." My raw material has always been emotion but for the past six years, I have changed medium from clay, concrete and bonze to pure human potential. Seeing a woman (or a man) going through a challenging time feels little bit like being faced with a pack of clay: a block of raw material, knowing there is a gem, the essence of fabulousness hidden in its core. I see the potential. I know it's here. But sometimes knowing it is not enough. When working with clay, I am the artist. When I work with you, you are the master revealing your inner magic power. You are the one uncovering your inner light and expressing your potential. I'm just here to witness this marvelous self expression and help you in this journey. Here are the steps you will have to take to reveal who you are and manifest what you want. Creating a sculpture starts with removing the excess of material. When you work on yourself, you start the same way: remove the blocks, the limitations, the doubts and anxiety. Let go of the hurts and limiting beliefs. As the sculpture emerge it expends in every direction. As you emerge, you stretch out, you try new ideas and challenge yourself. You need an armature to not fall down. When working with clay, sticks and pieces of wood will suffice. Working with your soul, the armature is made of values, affirmations and visualization of the direction you want to take. Try a gesture or another one until you find the one that speak to your soul. In human equivalent, this step is about trying new ideas, getting out of your comfort zone. In art like in life, beauty resides in balance. As you are reaching for your true potential, what is important for you. What would you like more of, and how can you prioritize that without forgetting about the other part of your life? A sculpture beauty resides in the impression it makes. In order to create and impression and have an impact on this planet, you have to be seen. Light, lines, planes, deep cuts, this is your time to express yourself and show to the word who you really are. Smooth or rough, it all depend on the piece and the effect I want it to have. This is the time for the last finishing touch. Let's put some color and go out in the word. What is Your role in this society? What is Your magic about? How will You impact this planet? Whether you will finish in a museum recognized as a masterpiece or creating change in a smaller scale just around you, this is your time. You are the sculptor of your life. Go out and live it. Are you ready to create some art? Are you ready to manifest your life? To be the YOU you are supposed to be? I can't wait to see you. You are the master of your destiny. And if you need some guidance, reach out for help. Schedule some time to talk.